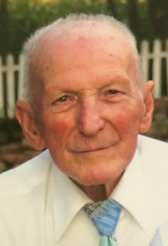 Glen E. Kline, 98, of South Brown Street, passed away Friday, Aug. 24, 2018, at his home surrounded by his family. He was born on Dec. 25, 1919, in McClure, a son of the late Clair Kline and Vera (Weader) Kline-Clare. On Sept. 23, 1939, he married Charlotte L. (Goss) Kline, who survives. His passing breaks a marital union of almost 80 years. Glen graduated from McClure High School in 1939. After graduating from high school, he served in the Army infantry during WWII. He was employed at Standard Steel in Lewistown, where he was a lathe operator for more than 40 years before retiring. Mr. Kline was a member of Mt. Bethel Church in McClure where he served as an elder. In his spare time, he enjoyed working in the machine shop at his house, carpentry, gardening and spending time on the mountain which he did three days a week. Surviving in addition to his wife are, one son and daughter-in-law, Sherman H. and Sue Kline, of Reedsville; one daughter and son-in-law, Delores and Ken Wright, of McClure; grandchildren, Tracy, Brian, Scott, Mark, Michelle and Tricia; 10 great-grandchildren; eight great-great-grandchildren; one brother and sister-in-law, Norman and Myrletta Kline, of Selinsgrove; and several cousins. He was preceded in death by one daughter, Linda Marie Kline; two brothers and one sister-in-law, Edgar Kline and Richard Kline and wife Bonnie; and two sisters, Gladys Schlaline and Erma Goss. Visitation will be held 10-11 a.m., Saturday, Sept. 8, followed by a memorial service at 11 a.m. at Mt. Bethel Church in McClure with the Rev. Robert Nash and the Rev. Donald Wise officiating. Interment will follow in McClure Union Cemetery. Contributions in lieu of flowers in his memory may be made to Mt. Bethel Church, 16 E Specht St, McClure, PA 17841.